There are few names in dance music today, which need less of an introduction than Masters At Work. Their name says it all! 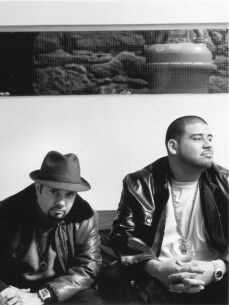 The ground-breaking project of Louie Vega and Kenny Dope, Masters At Work forged a reputation for genre-eschewing DJ sets and flawless house production throughout their extraordinary careers, while their influence and reach, changed house forever standing behind dozens of the biggest club hits and remixes of their time. Effectively soundtracking the American nightclub scene of the 1990s, Vega and Gonzalez blended their love of the disparate music coming from New York's underground clubs during the 1980s - disco, the freewheeling garage scene, emerging house and hip-hop styles, Latin freestyle - to enormously influence the mainstream dance sound as it coalesced during the following decade. Taking the distinct and already highly praised production aesthetic of Vega and fusing it with Gonzalez's encyclopaedic knowledge of breaks, hip-hop and beat creation, Masters At Work created an accessible yet defiantly underground sound that is still being copied and referenced – but crucially never bettered – by many of today’s contemporary producers. Celebrating 25 years together, shepherding dance music down new paths with their inventive production style and imaginative feel for different musical forms. The two native New Yorkers have amassed an overwhelming body of work in that time, one that includes over fifteen hundred original productions, remixes and side projects, redefining the way we think of music in clubs. Four time Grammy award nominees, Masters At Work have defiantly mixed everything they can find – house, hip hop, funk, disco, latin, African, jazz and minimal Maw dub tracks – into a universal groove such as Nuyorican Soul, KenLou, MAW, The Bucketheads and Hardrive to name a few. And in doing so MAW has become a cultural melange unto itself, emblematic of the multi-cultural society in which we live. In 2012, Masters At Work have reunited over ten years later, toured and played at Ibiza with Carl Cox at Space, with Luciano at Ushuaia for the closing, Rock In Rio, Rock in Rio Lisbon, BPM at the Crosstown Rebel’s Rebel Rave event, Red Bull Academy event in San Francisco and New York, O2 Arena in London to name a few. Masterworks: Essential KenLou House Mixes In early 1997, the MAW duo issued the most high-profile release of its career (at least in terms of the music establishment), a self-titled full-length as Nuyorican Soul. Recorded with input from a host of jazz and past Latin masters (George Benson, Roy Ayers, Tito Puente, Charlie Sepulveda, Dave Valentin), the album spawned several club hits, including "Runaway" and "It's Alright, I Feel It." The following year, Masters at Work compiled some of their best productions for Masterworks: Essential KenLou House Mixes and MAW Records: The Compilation, Vol. 1. Two years later, BBE trumped both with the release of the four.